DECEMBER 14, 2018 – The ELTEC team recently joined forces with the city of Burkburnett, Burkburnett ISD, and Traffic Speed Modulation, LLC, to try a new retractable speed bump. Burkburnett was the beta site for the new speed bump, becoming the country’s first city to use such technology. The installation in Burkburnett reflects the ideas behind the creation of the retractable speed bump. Keeping pedestrians safe doesn’t have to be a major cost, and speed bumps can be utilized at times when they are needed the most. The speed bumps, designed by Traffic Speed Modulation, LLC, and administered by ELTEC, are 8 feet wide to cover a major portion of the road. Each retractable speed bump is powered by solar power. Within the speed bumps, metal plates inflate using industrial-grade airbags found in railroad applications. Using the ELTEC time clock, the retractable speed bumps can be placed on a timer. In the case of Burkburnett, the speed bumps are used during school hours only. The center chamber of the speed bumps are inflated with the airbag, causing an incline in the outermost sections found within the hump and inside of a fixture that’s securely mounted inside pavement. This breakthrough system means that more cities can keep pedestrians, even young schoolchildren, safe along the roadways. ELTEC has been an industry leader in traffic products and warning systems for more than 50 years. Their products include LED enhanced signs, 24-hour warning systems, school zone systems, time clocks, traffic controllers, pedestrian crossing systems, and more. With the launch of the new retractable speed bump, ELTEC continues a tradition of helping municipalities keep drivers and pedestrians safe with leading-edge technology at competitive price points. 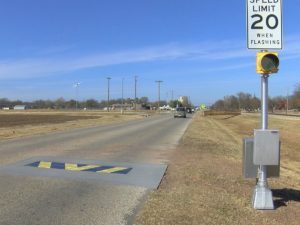 The Burkburnett retractable speed bump was done as part of a beta test conducted by ELTEC. Due to the success of the initial installation, ELTEC is announcing that they will now be offering the retractable speed bump to municipalities across the country.